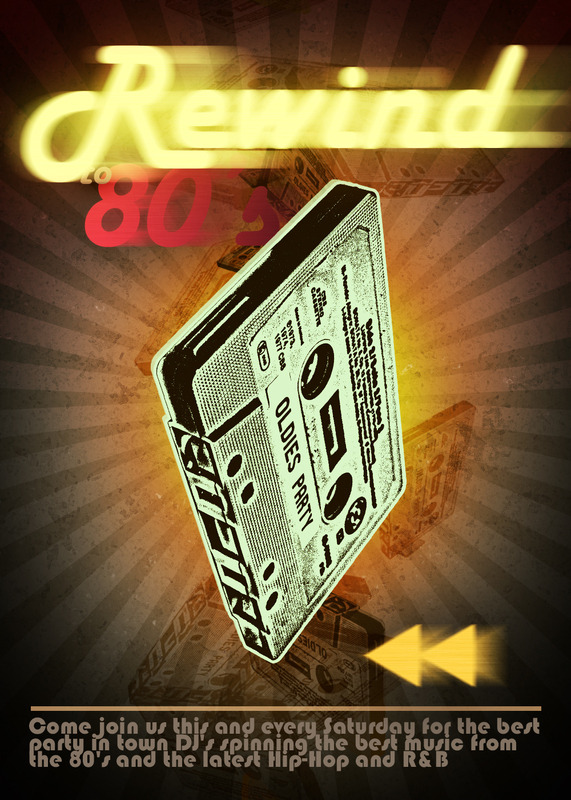 In this tutorial, I'll show you how to design a poster for an 80's anthem party. Throughout this tutorial, we'll create some textures for background, manipulate a photo to give it a stylish look, and make some color variations. Let's jump into this super rad tutorial. Create a new document 1000 pixels wide and 1400 pixels high, with Resolution set to 300 pixels per inch. Fill the "Background" layer with the color #c2bbaa. Hit Command + A to select all. Next, drag one vertical and one horizontal guide, then place them in the center of your document. Deselect by hitting Command + D. Change your Foreground Color to #bbb099, get the Custom Shape tool and pick the "Registration Target 2" shape, which is in the Symbols category from the Custom Shape Picker. Set to Fill pixels. Next, while holding down the Shift and Alt keys, start drawing the shape from the center, as in the below image. By the way you can always hide or unhide guides by pressing Command + H.
Now we need to apply a layer style to the background layer, but because it's the "Background" Layer we can not. Go to Layer > New > Layer From Background and name the layer "Rays." Now apply a Gradient Overlay using these settings: Blend Mode set to Color Burn, Opacity at 55%, Gradient set to Black to White, Style set to Radial and Reverse checked. Create a new layer and name it "Dirt." Pick 60% gray as your Foreground and black as your Background Color. Go to Filter > Render > Clouds. Then go to Filter > Render > Difference Clouds. Go to Filter > Artistic > Film Grain and set the Grain to 5, Highlight Area to 0, Intensity to 2 and then apply. Now go to Filter > Sharpen > Unsharp Mask, set Amount at 500%, Radius to 18 pixels and Threshold to 40 levels. Go to Filter > Artistic > Fresco, set the Brush Size to 10, Brush Detail to 10 and Texture to 1. Now go to Image > Adjustments > Levels (Command + L) and set Input Levels to 15, 1, 110. Set Layer Blending Mode to Screen and Layer Opacity at 50%. Create a new layer and name it "Dark." Get the Elliptical Marquee Tool, then while holding down the Alt key, make a selection starting from the center of the canvas, as in the image below. Go to Select > Inverse and fill the selection with black. Hit Command + D to deselect and go to Filter > Blur > Gaussian Blur and apply with a Radius of 150 pixels. Set the Interior Opacity (Fill) for the Layer at 20% and set the Blending Mode to Linear Burn. Now let's add some more dirt texture. Create a new layer named "Dirt 2" above the "Dirt" layer. Set your Foreground Color to White and Background Color to Black. Get the Brush Tool and pick "Scattered Maple Leaves" from the Brush Preset Picker. Set the Master Diameter to 250 pixels. Go to Color Dynamics in the Brushes Palette and set the Foreground/Background Jitter at 100%. Paint the whole layer with the brush. Set the brush Painting Mode to Difference in the Tool Options and paint the canvas over again. Then go to Filter > Artistic > Film Grain, then set Grain to 6, Highlight Area to 0 and Intensity to 2. Go to Filter > Artistic > Fresco, then set Brush Size to 1, Brush Detail to 10 and Texture to 3. Next, go to Filter > Stylize > Solarize. Now go to Image > Adjustments > Invert. Now set Layer Blending Mode to Linear Burn and set Opacity at 20%. A poster should attract attention and in order to achieve this goal we're going to use a simple familiar object as the main focus of our poster. This object will be a cassette because it has an association with the 80's. Now let's open the cassette image. Download the image file here and open it in Photoshop. Get the Horizontal Type Tool (T) and type your text like in the below image. I used the font PTF Nordic, which can be downloaded from Dafont.com via this link for free. Create a new layer above the "Background" layer named "Rectangle" and get the Rectangular Marquee Tool. Make a selection as shown and fill it with color #dddfd2. Go to the text layer in the Layers Palette and hit Command + E to merge the top two layers. Deselect by hitting Command + D.
Go to Edit > Transform > Distort and fit the perspective of the "Rectangle" layer to the cassette. Then scale it down a little bit as you can see in the image below. Make sure the "Rectangle" layer is selected in the Layers Palette and press Command + E to merge the layers. Grab the Pen Tool, set it to Paths in the Tool Options and draw a path around the cassette. Go to Paths Palette and Command-click the "Work Path" to make a selection out of the path. Go back to the "Background" layer in the Layers Palette. Go to Layer > New > Layer via Copy. Name the new layer "Casette." Deselect, then go to the "Background" layer and fill it with white. Let's give this photo a stylistic look. Go to the "Casette" layer in the Layers Palette. Next, go to Layer > New Adjustment Layer > Threshold. Set the Threshold Level to 210. Using Adjustment Layers is a good way because you can always double-click it and change the settings. Go to the "Casette" layer, then go to Filter > Sharpen > Unsharp Mask. Set the Amount at 500%, Radius to 15 pixels and Threshold to 5 levels. Go to the Threshold Adjustment Layer in the Layers Palette and Hit Command + E to merge. Command-click the "Casette" layer to load it's pixels. Create a new layer on top and name it "Casette B." Fill the selection with color #392200. Go back to the "Casette" layer, copy by going to Edit > Copy. Now go to the Channels Palette and create a new channel and paste by going to Edit > Paste. Command-click the "Alpha 1" channel to load the white pixels as a selection. Go back to the Layers Palette and create a new layer on top. Name it "Casette W". Next, fill the selection with the color #bbee99. Hit Command + E twice to merge the top three layers, and then Deselect. Drag the "Casette" layer to your "Retro.PSD" document. Hit Command + T to enter Free Transform Mode and set the Horizontal and Vertical Scales to 35%, then set the Rotation to 100 degrees. Place the cassette in the middle of the canvas as shown. Create a new layer below the "Casette" layer and name it "Stroke." Command-click the "Casette" layer to load the selection and fill it with the color #bbee99. Deselect by hitting Command + D. Grab the Move Tool and move the "Stroke" layer 10 pixels left and 3 pixels up. Apply a Stroke Layer Style to the "Casette" layer using these settings: Size set to 5 pixels, Position set to Outside, Blend Mode set to Normal, Opacity set at 100%, and Color set to #bbee99. Command-click the "Casette" layer again. Go to Edit > Define Brush Preset and name the brush "Casette." Now Deselect. Grab the Brush Tool, pick the "Casette" brush you have just defined, and set Master Diameter to 200 pixels. Go to the Brushes Panel and under Brush Tip Shape, set the Spacing at 370%, check Shape Dynamics, then set Size Jitter and Angle Jitter to 100%. Create a new layer named "Falling 1." Set your Foreground Color to #553300. Paint the center of the canvas vertically, as in the below image. Create a new layer and name it "Falling 2." This time set the Master Diameter to 400 pixels and paint again, as you did in the previous step. Set the Layer Blending Mode to Soft Light and set the Layer Opacity at 60%. Go to the "Stroke" layer and set the Layer Opacity at 75%. Create a new layer above the "Rays" layer, name it "Shadow." Grab the Elliptical Marquee Tool and make a selection, as in the image below. Fill the selection with the color #553300. Deselect and go to Filter > Blur > Gaussian Blur. Apply with a Radius of 100 pixels. Now hit Command + Alt + F to bring up the Gaussian Blur dialog again, this time apply with a Radius of 50 pixels. Grab the Horizontal type Tool and type the text Rewind. Set the text color to #cc9966. I used Harlow Solid Italic, you can pick your favorite font. Go to Layer > Rasterize > Layer. Duplicate the layer. Make sure the "Rewind copy" layer is selected in the Layers Palette. Go to Filter > Noise > Add Noise. Set Amount at 25%, set Distribution to Uniform and check Monochromatic. Go to Filter > Blur > Motion Blur. Set the Angle to 0 degrees and Distance to 200 pixels and apply. Now go to the "Rewind" layer, apply another Motion Blur filter. This time, for the Distance set it to 20 pixels. We'll also apply a Drop Shadow Layer Style using these settings: Blend Mode set to Multiply, Color set to Black, Opacity at 75%, Distance set to 0 pixels, Spread set at 2% and Size set to 150 pixels. Now we'll create another text layer. Type 80's this time. Go to Layer > Rasterize > Layer. Duplicate the "80's" layer by going to Layer > Duplicate. Make sure the "80's copy" layer is selected in the Layers Palette. Go to Filter > Noise > Add Noise. Set the Amount at 20%, set Distribution to Uniform and check Monochromatic. Go to Filter > Blur > Motion Blur. Set the Angle to 0 degrees and Distance to 80 pixels and apply. Now go to "80's" layer, apply another Motion Blur filter. This time, for the Distance set it to 10 pixels. We'll also apply a Drop Shadow Layer Style using these settings: Blend Mode set to Multiply, Color set to Black, Opacity at 75%, Distance set to 0 pixels, Spread set at 2% and Size set to 150 pixels. Create another text layer above the "80's copy" layer. Type and place the word to as you can see in the image below. Next, apply a Drop Shadow using the following settings: Blend Mode set to Linear Burn, Color set to Black, Opacity at 45%, Distance set to 0 pixels, Spread set at 2% and Size set to 40 pixels. Select the "80's" and "80's copy" layers in the Layers Palette and hit Command + E to merge them. The merged layer will be named "80's copy." Drag this layer beneath the "Stroke" layer in the Layers Palette. Apply a Gradient Overlay with these settings: Blend Mode set to Multiply, Opacity at 50%, Gradient set to Black to White, Style set to Linear, Angle set to 180 degrees and Scale set at 100%. This layer style will give the shadow effect coming from the cassette. Let's put a text block containing some information. Grab the Horizontal Type Tool, starting from the top left corner, click and drag to create a rectangular text area as shown. Type your text here. I used the font "Bauhaus 93." Set the Font Size to 10 pt, leading to 7 pt, set Color to #887766. We need more weight at the bottom of our poster because now it is still unbalanced. Grab the Rectangular Marquee Tool and make a selection as shown. Create a new layer and name it "Line." Fill the selection with #cc9966. Set the Layer Opacity at 80%. Create a new layer and name it "Triangle." Grab the Custom Shape Tool, set it to Fill Pixels in the Tool Options and pick the Triangle shape. Draw a triangle like in the below image. Hit Command + T to enter Free Transform Mode and Rotate the triangle 90 degrees counter clockwise. Duplicate the "Triangle" layer and move the copy left to make a rewind symbol. Now hit Command + E to merge both triangles and name the merged layer "Rewind icon." Duplicate the "Rewind icon" layer. Go to Filter > Noise > Add Noise. Set the Amount at 25%, set Distribution to Uniform and check Monochromatic. Go to Filter > Blur > Motion Blur, then set the Angle to 0 degrees and Distance to 80 pixels and apply. Now go to the "Rewind icon " layer, apply another Motion Blur filter. This time, for the Distance set it to 10 pixels. We'll also apply a Drop Shadow Layer Style using these settings: Blend Mode set to Multiply, Color set to Black, Opacity at 75%, Distance set to 0 pixels, Spread set at 2% and Size set to 150 pixels. You're almost done with your poster. The design looks balanced but we need some warm colors in it. Go to the "Shadow" layer and apply a Gradient Overlay Layer Style using these settings: Blend Mode set to Linear Dodge, Opacity at 60%, Gradient set to Orange to Yellow to Orange, Style set to Radial and Scale set at 80%. Go to the "Dark" layer and apply a Gradient Overlay using these settings: Blend Mode set to Color Burn, Opacity set at 100%, Gradient set as Violet to Orange, with a Style of Linear, Angle set to 90 degrees and Scale set at 100%. Select both the "Rewind" and "Rewind copy" layers in the Layers Palette and hit Command + E to merge them. Name the merged layer "Rewind." Next, apply a Gradient Overlay to the layer with these settings: Blend Mode set to Linear Dodge, Opacity at 80%, Gradient set as Orange to Yellow to Orange, Style set to Linear, Angle set to 90 degrees and Scale set at 100%. Go to the "80's copy" layer. Next, go to Image > Adjustments > Hue/Saturation. Set Hue to -35, Saturation to 50 and hit OK. Select both the "Rewind Icon " and "Rewind Icon Copy" layers and merge them by hitting Command + E. Go to Image > Adjustments > Hue/Saturation, set Hue to 10, Saturation to 50 and apply. Go to the "Falling 2" layer and apply a Gradient Overlay using these settings: Blend Mode set to Color Burn, Opacity set at 30%, Gradient set as Black to White, Reverse checked, Style set to Linear, Angle set to 90 degrees and scale set at 100%. This will make the top half of the layer more visible. At this point, we may make some color variations for our poster. In the image below you can see some variations that I made using a Gradient Map Adjustment Layer with different Layer Blending Modes and Opacity, which I will be explaining in the next step. Go to the Layers Palette and select the top most layer. Go to Layer > New Adjustment Layer > Gradient Map. Set the Gradient as Black to White and hit OK. Set the Layer Blending Mode to Overlay and Opacity at 60%. Yes that's it. Now we have our poster done. Hope you learned something new and enjoyed this tutorial. You can view the final image below or view a larger version here.